The Clinton and Trump campaigns traded barbs over which presidential candidate Americans can trust, two days after the FBI released notes from its July interview with Hillary Clinton concerning her handling of emails as secretary of state. The FBI already announced it uncovered no criminal wrongdoing, but the notes underscore conclusions that have dogged Clinton for months. More than two dozen times, Clinton said she could not remember details about her electronic correspondence as secretary of state. During her tenure, she used a private email account to conduct official business. The FBI was only partially successful recovering data from a private server that had been wiped clean. 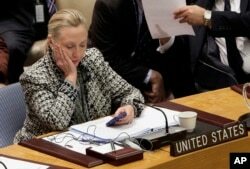 Campaign 2016 Clinton Emails: FILE - In this March 12, 2012, file photo, then-Secretary of State Hillary Clinton checks her mobile phone after her address to the Security Council at United Nations headquarters. In a rare step, the FBI on Friday, Sept. 2, 2016, published scores of pages about confidential interviews with Hillary Clinton and others from its recently closed investigation into the former secretary of state’s use of a private email server. “A former U.S. senator, former first lady, and, certainly, the sitting secretary of state should know what the ‘C’ means,” Conway said. The FBI said it cannot be sure foreign entities did not gain access to classified material Clinton sent or received while serving as President Barack Obama’s first secretary of state. But it the focus is on sensitive data falling into the wrong hands, Kaine argued the most egregious act by far was Trump publicly stating that Russia should try to find Clinton’s missing emails. The FBI released 58 pages of notes on Friday, two days after Donald Trump’s trip to Mexico and subsequent immigration speech ignited a media firestorm and drew sharp criticism from Democrats. Although most polls show Clinton leading Trump nationally, the margin has narrowed and majorities of Americans view both Clinton and Trump unfavorably.